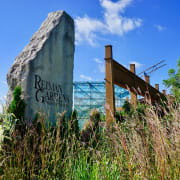 Would you recommend Reiman Gardens? The people were very nice. I stenciled pumpkins and planted tulip bulbs recently, and both were well organized. I love knowing that what I do today, like planting the tulip bulbs, can impress people tommorow.